Other Practices to include: metta bhavana, readings from Shantideva’s Bodhicaryavatara, Sevenfold Puja, ways to allow the Bodhicitta to arise…perhaps even the Bodhicitta practice itself? 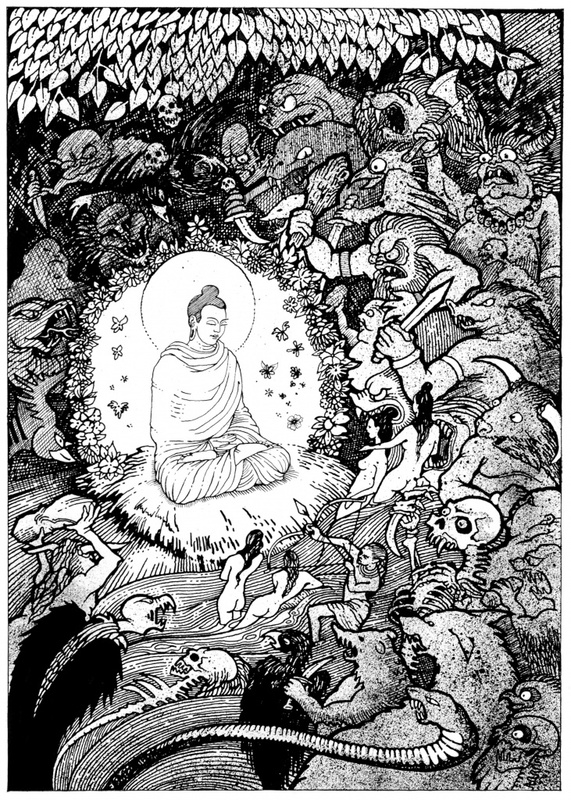 Image for your poster: Aloka has made available an image of his black & white line drawing of Mara attacking the Buddha. Short Talks: Yashobodhi has recorded 7 short talks especially for this occasion; a short (8 mins) intro to the mind training verses and then 7 talks about 20 minutes long on each of the verses. They will be available on this page. The Lojong slogans she uses are attached. Banner with images for the shrine: Sanghadhara from Clear Vision kindly designed a poster out of the images of ‘dharma doors’ from around the world. 8 x A4/Letter posters can be printed out by Centres and stuck together to form a long rectangular banner that can be placed against the shrine. Guide ‘How to Run an Urban Retreat’ - with helpful suggestions. Leaders of the week may wish to prepare by listening to talks by Yashobodhi and/or Dhammadinna, or the short talks given at the International Council earlier this year. life just does not go as we want it to go, in both small and large ways …these are all part of Mara’s attack, and our task is to turn it into flowers! difficulties are in essence things not going as you want – what this does is confront us with our attachment to how we want things to be, confront us with our ego-clinging and self-centredness. So, the main point of this practice: seeing difficulties that arise as opportunities to turn arrows into flowers.